Every time someone new steps foot into my shop, which is usually just a tradesman or the landlord checking in, I catch them staring at my newly created accent wall. “What is this?“, they ask as they graze their hand over the wall. “It’s a wallpaper mural” I say. While most of us are properly familiar with the traditional rolls of wallpaper that come with a repeat pattern, a mural is slightly different. 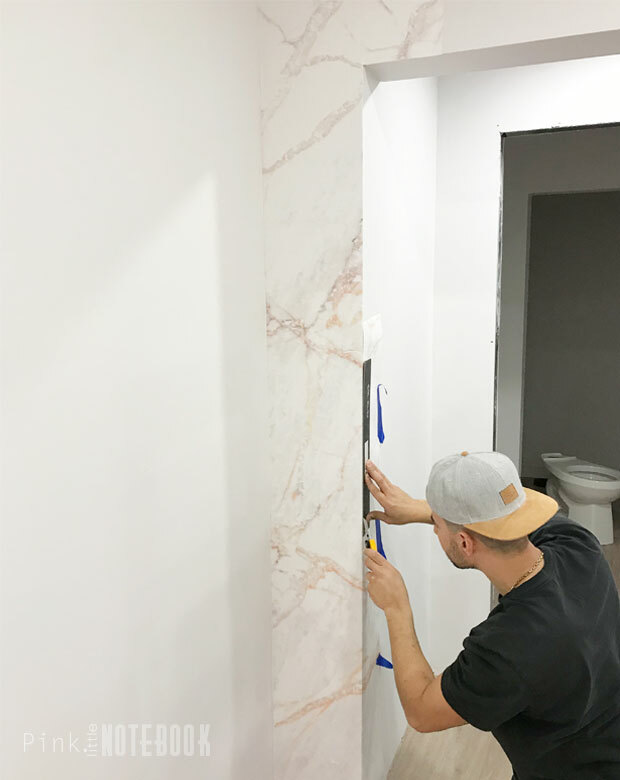 This marble feature wall is from a UK based company Murals Wallpaper. They make trendy high quality murals, pattern and photo wallpapers that are shipped worldwide. 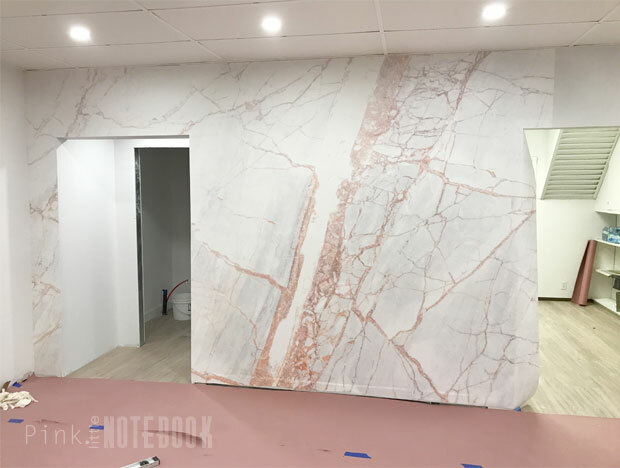 This particular mural used in my shop is part of their marble collection (Style: Crackle Bronze Texture Marble Wallpaper). 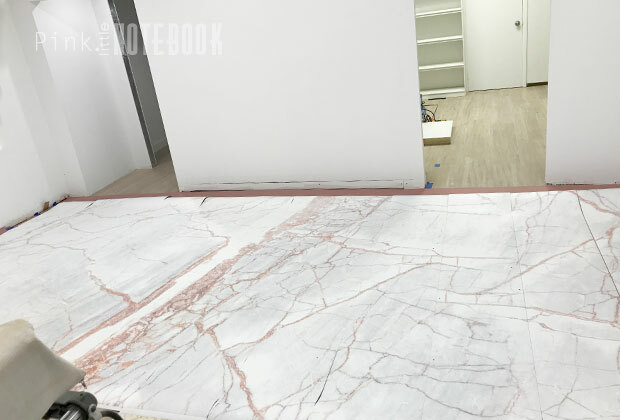 Since murals do not have a repeat pattern, each product is made to order. All you have to do is provide the size of your wall (length x width) and you get a custom fitted wallpaper for your space. When you receive your high resolution print, it comes in one giant roll. 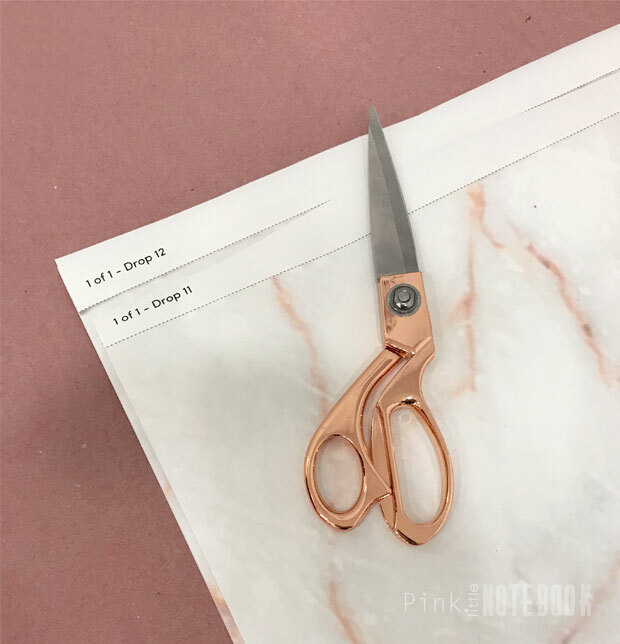 As you unroll it, you will see a cut line identified by a numbering system. As I cut the panels, I laid them out on the floor to get a visual. The consecutive numbering system works from left to right. So the first panel will always start on the left side of your wall. Using a pre-mixed wallpaper paste, we rolled it onto the wall. We applied the first panel to the top of wall and working our way down as we smoothed out any air bubbles. I love that Murals Wallpaper prints an extra 1-2% on top of your measurements to account for uneven walls. Use a thin coat of the pre-mixed wallpaper paste. If you put too much on the wall and you go to smooth out your bubbles, the adhesive will spill out from all corners, resulting in a big mess. The wallpaper panels have a butted seam, where the edges just meet each other vs overlapping. I found it easiest to apply the left side of the sheet to line up the seam and then smooth down the rest of the wallpaper. My favourite tool to aid in trimming the edges or corners is a large 2ft metal ruler. If you want a guaranteed straight edge every time, this is the perfect way to achieve it. The best way to work around a doorway is to cut out the top portion of the door first. This allows you to bend the wallpaper right over the side, which then can be easily folded and cut. Since we have no trim up yet, installation was a breeze. I can’t tell you how excited I am for this wall! I’ll be finishing it off with a blush pink bathroom door and baseboards. Disclosure: I only use products I love and trust and I’m ecstatic, Murals Wallpaper, has agreed to partner with me in my unit makeover. As always, this post reflects my honest thoughts and opinions. This wall is amazing! I can’t wait to see how you pull it all together. Oooh what a pretty wall! And you did such a great job at putting it up. Wow! It looks so pretty — I love it! Great way to really change up a space Sabrina! There are some brilliant patterns out there. Looks like this one worked out perfectly for you. 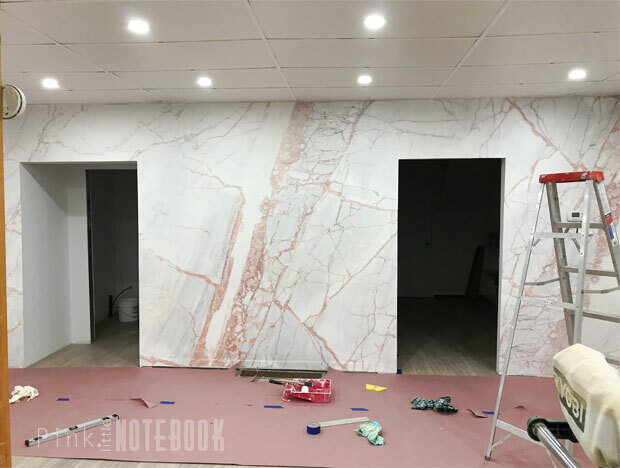 This marble wall paper is gorgeous! This is something I would put in my bathroom! This looks so good! I love the marble accent wall. That’s such a good idea. This looks so gorgeous and sophisticated! It really does transform the space. I really want to try something like this at home!